You are into project management and you blog, how cool would it be if you can get some PDU's from your blog? 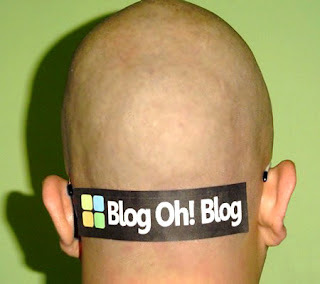 Do you think it will bring your blog some additional recognition, make it more fun to write now that you are getting something measurable from your blog? I saw a tweet from Dina and thought "wow", this couldn't be better. Read on, if this interests you and be sure to let your opinion out there in the comment section. Steppingintopm: I read through Twitter that you are thinking of getting PDU's in exchange of project management blogs - can you please elaborate on the idea and how you thought of it? Dina: Well, I can't really take credit for the idea. I think the first record of the idea on twitter came from Vincent Birlouez who asked the question "does publishing a blog bring PDUs?" And then, Kelvin Zhao replied: According to this I think blogging can earn PDUs. So, that's when I got in on the conversation. I'm always looking for cost effective ways to earn PDU's, I mean I'd love to go to interesting classes and seminars, boot-camp like training, etc. But, that all costs money and that's not always easy to come by. There's a whole category of Self Directed Learning in the PMI handbook that lists the ways a PMP can earn credits independently or working with a group. So, blogging about project management is not specifically stated in the list of activities that can qualify for PDUs, but it just seems to make sense that being an active participant in PM blogging (and even other PM networking sites, PMs on twitter group, etc) should qualify for PDUs in the same way. I think it's really about changing for the times, these modes of communicating and information sharing didn't exist 10 years ago or whenever the last time the rules of earning a PDU were discussed. We can all benefit from joining in on the project management discussions in the social media world, so why not earn PDUs at the same time? Steppingintopm: What do you think should be the basics of a project management blog to be able to earn the PDU? Dina: I think if the blog post discusses any relevant topic in project management and shows some thought and research was done in preparation of the post, this should qualify. I don't know if a minimum word count is necessary, but in the same way that any article written is submitted to PMI for approval, maybe the blog post(s) could also be submitted. I would love to see some type of peer review board for blog posts rather than having PMI make the decision. Maybe a little survey at the bottom of the post asking if the post should qualify for a PDU (or two). 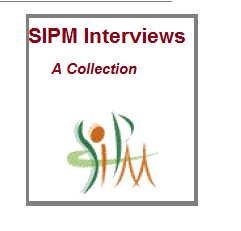 Steppingintopm: How did you get into the project management? Dina: I was a web programmer for 5-6 years before I got into project management. In the fall of 2003 I interviewed at an interactive agency for a programmer position and got turned down. I got called back a few months later when a project management role opened up. I figured, why not? Give it a try and see how it goes. I learned a lot from my almost 5 years there, a lot of trial and error. Right when I got my PMP in the beginning of 2008, I started doing a lot of 'pleasure' reading about web & software project management and just got hooked! I felt that I had a good deal of experience and now I wanted to learn from the 'experts' about how to make myself a better project manager. Now I'm the lead project manager of the interactive services department of a tech PR firm and one of my main responsibilities is improving the processes and implementing new ones. It's a great challenge to have. 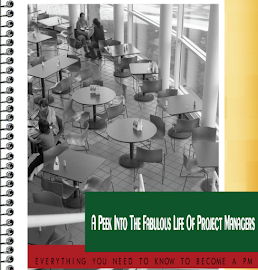 Steppingintopm: Three tips that you would like to share with aspiring project manager's? 1. Find a good mentor - It was a few years before I was able to find mentors, and ultimately the books and PM social networks I've found have served in that role. But, the earlier you can find a mentor, the better. 2. 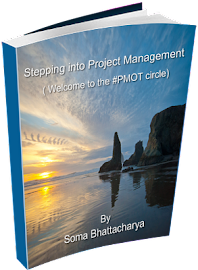 Read...a lot - The PMP is a nice title and all, but what I really got out of the process was introduction to many very interesting project management topics which I then did my own independent research & reading on after my PMP boot camp was over. Had I only started reading years earlier, I would have had real knowledge and lessons learned to apply to all the questions and challenges I had while I was learning through trial & error. 3. Don't get discouraged- Project management is an ongoing challenge, there's always something new coming out of left field. The short, simple and straightforward projects can almost get boring after a while. It's better to have something more complex that takes serious focus to keep going and complete successfully. So, don't get frustrated if things don't always go right in those complicated projects, there's always a lesson to be learned from it. Dina Garfinkel is a Web / Interactive Project Manager who lives in Brooklyn, New York with her husband and two daughters. She enjoys writing about the parallels between project management and parenting, on her blog The Critical Chain and can also be found on twitter . You can see more on earning PDU here as well. Steve- Thanks for leaving a comment and yes, lots of new things happening in the blogosphere! Happy to share, glad you liked it. The blog is useful and so informative for the project management information. Waoh!really,are these PDU acceptable with PMI? Earn PDU through blog is a great way. PMP certified people will like this. I am now ready for my pmp boot camp this week. Thank you for this wonderful information. Thank you for the information. I am getting ready for a pmp boot camp in DC early next week. So all the help I can get is much appreciated.